Out of the total of four Analogon releases (1 original + 3 remix editions), this is without a doubt the only one really worth having. 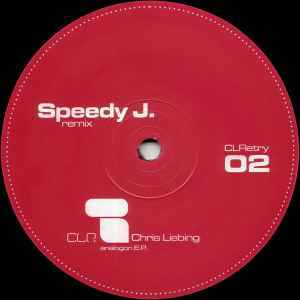 Speedy J does his remixing thing as good as ever, with a number that's a reowrk of the B1 Untitled off the original. It basically lands right in the middle of the action, with an awesome lead getting introduced after a while. The whole track slows down with that massive "howling" sound effect, and then Jochem does this impressive trick with rebuilding the track up from a slow motion tempo all the way through to to its initial speed; the percussion gradually accelerates until breaking off the chain and never looking back! Awesome, and is up there with his remix of Gaiden's Point Blank, which was also released in 2001. Adam Beyer's remix brings down the otherwise maximal vote this release should and would have gotten... Already his remix off the first installment of the Analogon remixes wasn't that impressive, while beind adequate and fairly entertaining, this time around he miserable fails. There is not enough energy let alone determination to even think of competing with the previous number. Beyer goes nowhere. The changes and effects in his remix sound random, as though they're there for the sake of being somewhere, instead of getting skillfully arranged, they come across as futile attempts of healing mr. Beyer's obvious lack of ideas as to where and how to go next with this track. A pity, for sure, but don't let that discourage you from getting your hands on this, the Speedy J remix is off the wall! A hard techno monster worth having and playing LOUD! With this record, the difference between stupid tooltechno and GREAT tooltechno becomes obvious. The Arrangement of SpeedyJ's remix creates a heavy tension, especially the Break in the center of the song. This is much better than the Chris Liebing "Standard" style which is not very innovative.